More than 30 materials science research groups in Aarhus have joined forces to prepare for new neutron and X-ray opportunities at ESS, MAX IV and European XFEL. AARHUS and COPENHAGEN—Across Europe, anticipation is growing for the European Spallation Source (ESS) scientific user program. Still nearly six years away, its impact on the scientific and industrial landscape can already be seen, particularly in Scandinavia, where Sweden and Denmark serve as the facility’s host states. Professor Bo Brummerstedt Iversen is director of iMAT, the strategic materials science research centre at Aarhus University. This movement was underscored most recently in Aarhus, Denmark’s second-largest city, where its more than 30 materials research groups have begun to work together to leverage the world-leading scientific opportunities ESS will provide. “We see this strategic initiative as a stepping stone to take advantage of the opportunities opening up at advanced international facilities, mainly ESS and MAX IV in Lund, and the XFEL in Hamburg,” says Professor Bo Brummerstedt Iversen, director of the new Centre for Integrated Materials Research (iMAT) at Aarhus University and a former member of the ESS Scientific Advisory Committee. iMAT was inaugurated on August 15 with a standing-room-only ceremony where the centre’s emphasis was made clear: interdisciplinary materials science research is key to finding the solutions to society’s grand challenges. This echoes strongly the vision of ESS as an organisation and the alignment of goals is no accident. Energy materials, a field in which Professor Brummerstedt Iversen is a leading researcher, will be one of iMAT’s pillars of innovation. Professor Brummerstedt Iversen and his group have undertaken many neutron-based studies, but have been held back by the available beam time at existing facilities as well as the limited neutron brightness of those facilities. Effective thermal neutron flux at existing reactor and accelerator-driven neutron sources as compared to ESS. A further advantage is the sheer power of ESS compared to other facilities. One critical parameter in neutron research is termed the “flux”, which denotes the number of neutrons travelling through a given unit area during a given period of time. 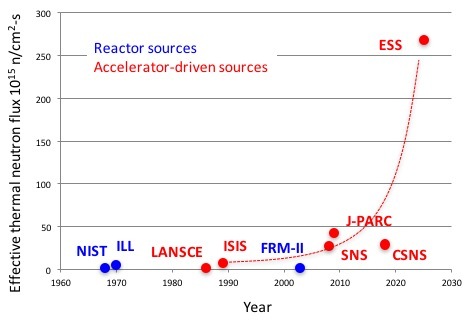 Neutrons are difficult to generate and require large nuclear reactors or spallation sources to produce in abundance. They are also neutral particles, and unlike X-rays and other techniques based on charged particles the neutrons cannot be easily steered to obtain higher concentrations at certain desired points. Low flux, then, is often the limiting factor in neutron investigations. The spallation process at ESS, however, will generate enough neutrons to increase the flux by as much as a factor of 100 for certain techniques. This translates into a dramatic increase in capacity while also opening doors to new types of investigations. One can moderate the beam to optimize certain parameters like resolution, or choose to do the same experiments as before, but at a much higher speed. Danish Power Systems (DPS) specializes in fuel cells of the Polymer Electrolyte Membrane (PEM) type (pictured above). Fuel cells transform either pure hydrogen or a hydrogen-rich energy source into electric power with high efficiency and extremely low environmental impact. Test set-up for a PEM cell at Danish Power Systems. Much like in a battery, a range of chemical reactions take place in a fuel cell. Neutron beams are a technique well suited for studying the involved reactions during operation. DPS manufactures the single PEM cells, which are the starting point for fuel cell systems. A major market is Uninterrupted Power Supply (UPS) systems, for instance for telecommunication towers in areas with unreliable power supply. Given the environmental advantages, a wider use of fuel cells would be desirable. However, the price remains a limiting factor for new applications. Neutron science instruments are essential to advancing these investigations. “We know positively that foreign universities and research organizations working on cells similar to ours have done in operando neutron beam experiments,” says Aage Hjuler. “We are keen to have experiments done, once ESS opens. In general, I am confident that industry will get on board research at ESS through joint projects with university groups. More than 16 million units sold annually make Grundfos one of the world’s leading suppliers of pumps. The company is a member of the Danish LINX Association, “a platform for linking industry to neutrons and X-rays” that is sponsored by Innovation Fund Denmark. Many Grundfos products are required to survive challenging environments for instance in water management, waste water and sewage systems. Grundfos is one of the world’s leading suppliers of pumps, with production facilities around the globe (here China). Through LINX, Grundfos and other companies are cooperating with groups at Aarhus University, the University of Copenhagen and the Technical University of Denmark (DTU).